Neon Flash spirea ais just one of several shrubs in its genus that has made a big splash in North American landscaping. Plant taxonomy classifies this bush most often as Spiraea japonica Neon Flash, but you will often see Spiraea x bumalda Neon Flash used, too as its botanical name (Neon Flash is the cultivar name). Spirea plants are classified botanically as broadleaf, deciduous flowering shrubs. They belong to the rose family. The cultivar name indicates the brilliance of this plant's deep pink flower clusters. Flowers bloom in early summer. Neon Flash sends multiple stems (covered with dense green foliage) straight up from its base and reaches 3 feet tall by 3 feet wide. Leaves have a bit of reddish color in them in spring; that same color reappears in fall, only darker. The foliage offers a relatively delicate texture and can form a contrast with larger-leafed plants such as oakleaf hydrangea. The species plant is indigenous to Japan. You can grow this bush in planting zones 4 to 8 in North America. Plant it in full sun to partial sun and in a well-drained soil. While one of the good points about spirea bushes is that they are not fussy about their growing needs, planting them in a loamy soil enriched with compost will promote the best performance. Neon Flash bushes may be attractive enough to use as specimen plants for the summer when they bloom, provided that you are industrious enough to deadhead them faithfully to encourage reblooming. But Gold Mound and Goldflame are better-suited to serve this function. You can also mass them together in landscaping property lines or grow them in front of a house, as foundation shrubs. Prune back the oldest few branches to ground level every other year. Some prune the remaining branches in early spring (these spirea bushes bloom on new wood) to within a foot or so of the ground, to encourage vigorous new growth. 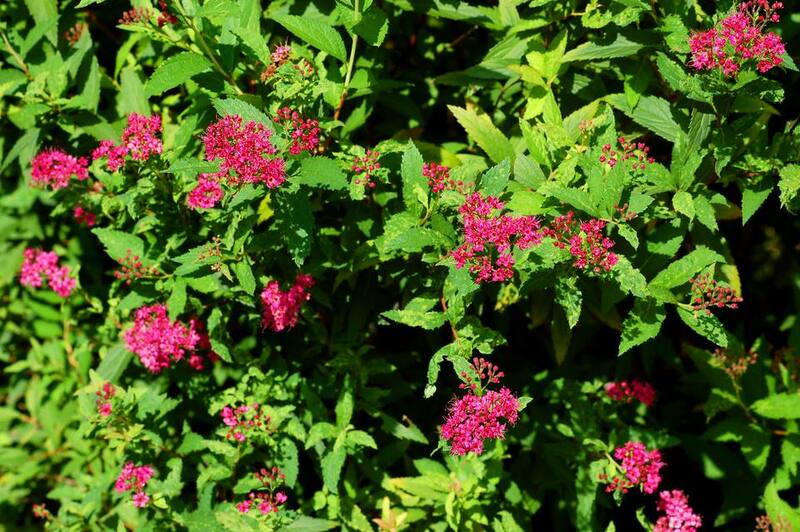 Also, Neon Flash spirea bushes will flower again if you deadhead or lightly trim them after the initial blooming. One outstanding feature of spirea bushes, in general, is that they require little maintenance. Maybe you grew up with a Vanhoutte spirea (S. x vanhouttei) in your parents' yard that has not received much attention for decades. Even after such neglect, it may well still produce clusters of white flowers (looking like nonpareil candies) every spring. Neon Flash spirea is also low-maintenance. Those seeking interesting foliage colors may select Gold Mound spirea (S. japonica Gold Mound), which lights up a landscape with its golden leaves. The foliage of Goldflame (S. japonica Goldflame) is not as bright as that of Gold Mound but offers a two-toned effect. Both Gold Mound and Goldflame bear pink flowers. Another pink-flowering shrub is the Anthony Waterer spirea (S. japonica Anthony Waterer). In fact, Neon Flash is considered an improvement on Anthony Waterer, which has been around longer. Bridalwreath spirea (S. prunifolia) has white flowers, but, unlike on the Vanhoutte, the flowers are larger, double, and do not appear in such tight clusters. Neon Flash is a plant that attracts butterflies. It also attracts birds and bees.